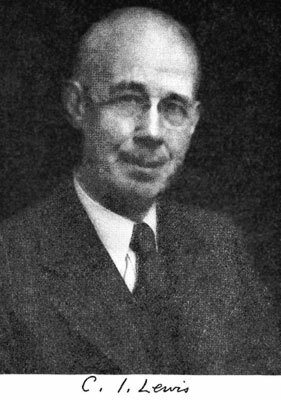 C. I. Lewis, An Analysis of Knowledge and Valuation, 1946. 1. The original determinations of analytic truth, and the final court of appeal with respect to it, cannot lie in linguistic usage, because meanings are not the creatures of language but are antecedent, and the relations of meanings are not determined by our syntactic conventions but are determinative of the significance which our syntactic usages may have. Once we have penetrated the circle of independent meanings and made genuine contact with them by our modes of expression, the appeal to linguistic relationships can enormously facilitate and extend our grasp of analytic truth. But the first such determinations and the final tests must lie with meanings in that sense in which there would be meanings even if there were no linguistic expression of them, and in which the progress of successful thinking must conform to actual connections of such meanings even if this progress of thought should be unformulated. When the subject of intension was first mentioned in Chapter III, we noted the possibility of more than one interpretation of intensional meaning, compatible with all that was there said of it. It is in fact possible to think of intension in either of two ways. First, it may be taken as constituted by the pattern of definitive and analytic relationships of the word or expression in question to other words and other expressions.1 Or second, it may be taken as the criterion in terms of sense by which the application of expressions is determined. The first of these, we shall call linguistic meaning; the second, sense meaning. The linguistic meaning of an expression is the intension of it as that property which is common to all expressions which could be substituted for the one in question without altering the truth or falsity of any statement, or altering the signification of any other context in which this expression in question should be constituent. It is intensional meaning in the sense in which the intension of a term would be discursively exhibited by the totality of other terms which must be applicable to a thing if the term in question applies; and in which the intensional meaning of a statement would be discursively exhibited by the totality of other statements deducible from it. It is intensional meaning in the sense in which what a word means is other words and phrases; and what a statement means is other statements. One who tries to find out how otherwise he may express himself when those addressed fail to understand him, is concerned with linguistic meaning; as is also one who fails to understand an expression and seeks to remove his difficulty by the discovery of linguistic equivalents. Or to take a more nearly adequate example: one who tried to learn the meaning of an Arabic word with only an Arabic dictionary at hand, might -- if his acquaintance with Arabic be slight -- be obliged to look up also words used in defining the one whose meaning he sought, and the further words defining these, and so on.2 He might thus eventually determine an extended pattern of linguistic relations of the word in question to other Arabic expressions. If the process of this example could, by some miracle, be carried to its logical limit, a person might thus come to grasp completely and with complete accuracy the linguistic pattern relating the term in question to all other terms in Arabic with which it had any essential or analytic relationship. But -- supposing the person in question to be also lacking in wit, so that he learned nothing through his investigation excepting that of which the dictionary informed him -- he might still fail to understand, in a sense which will be obvious, what any one of these words meant. What he would grasp would be their linguistic meaning. And what he might still fail to grasp would be their sense meaning. What we indicate by this phrase sense meaning is intension as a criterion in mind, by reference to which one is able to apply or refuse to apply the expression in question in the case of presented, or imagined, things nf situations.3 One who should be able to apply or refuse to apply an expression correctly under all imaginable circumstances, would grasp its sense meaning perfectly. But if, through faulty language sense or poor analytic powers, he could still not offer any correct definition, then he would fail to grasp (at least to grasp explicitly) its linguistic meaning. Because many logicians have of late been somewhat preoccupied with language, intension as linguistic (or 'syntactic' meaning has been overemphasized, and sense meaning has been relatively neglected. These two aspects of intensional meaning are supplementary, not alternative; and separable by abstraction rather than separated. One would seldom, if ever, carry out any investigation of meaning in terms of either one of them exclusively. Traditionally, the notion of intension has been explained, now in the manner of linguistic meaning, now in that of sense meaning, and often times in ways which speak of them both together. This failure, or refusal, to separate the two is fundamentally right-minded rather than mistaken. But there are motives of some importance for epistemology which lead to their distinction: and on the whole it is sense meaning which is the more important for investigation of knowledge, and should be emphasized. For example, those who demand theoretical verifiability or confirmability for significance in a statement, have in mind sense meaning as the prime requisite of meaningfulness in general. Likewise those who would set up the criterion of making some empirically determinable difference as the test of any genuine difference of meaning. And those who would demand operational significance in any precise and acceptable concept are insisting upon the requirement of sense meaning. 2. For sense meaning, imagery is obviously requisite. Only through the capacity called imagination could one have in mind, in advance, a workable criterion for applying or refusing to apply an expression under all circumstances of presentation. But for reasons made familiar by the long controversy between nominalists, conceptualists and realists in logic, sense meaning cannot be vested directly and simply in imagery. The nominalist denies the possibility of sense meaning on such grounds as the impossibility of imaging dog in general or triangle in general, or of having in mind any representation of a chiliagon which should be adequate for distinguishing between a polygon of 1000 sides and one having 999. It is the persistence of such nominalism which, in large measure, is responsible for the current tendency to identify meaning with linguistic meaning exclusively. The utter weakness of nominalism lies in the obvious fact that we do entertain general meanings, as we could not if the nominalist were right. But the nominalistic premises are likewise obvious facts; and it is the weakness of logical realism and of most conceptualist doctrines that they offer nothing better than verbal and unintelligible answers to these nominalist objections. The valid answer was indicated by Kant. A sense meaning, whenj precise and explicit, is a schema; a rule or prescribed routine and an imagined result of it which will determine applicability of the expression in question. We cannot adequately imagine a chiliagon, but we easily imagine counting the sides of a polygon and getting 1000 as the result. We cannot imagine triangle in general, but we easily imagine following the periphery of a figure with the eye or a finger and discovering it to be a closed figure with three angles. Many protagonists of operational significance forget to mention the imagined result, and would -- according to what they say -- identify the concept or meaning exclusively with the routine. Presumably this is merely an oversight: no procedure of laying meter sticks on things would determine length without some anticipatory imagery of a perceivable result which would, for example, corroborate statement that the thing is three meters long.4 When the meter stick has been applied, it is some observed coincidence which gives the decision of length; else there is none. The operations are requisite only in the sense of setting up conditions under which an observation giving this decision will be possible. If the physicist find a meter stick already lying on the object to be measured, in the required fashion, he will not insist on taking it up and performing the operation of applying it before taking his reading. But although the notion of what we here call sense meaning has been emphasized by pragmatists, operationists and holders of empiricist theories in general, it would be claiming too much for these theories of knowledge to grant them any monopoly of the conception. Because attribution of meaning in this sense requires only two things; (1) that determination of applicability or non-applicability of a term, I or truth or falsity of a statement, be possible by way of sense-presentable characters, and (2) that what such characters will, if presented, evidence applicability or truth should be fixed in advance of the particular experience, in the determination of the meaning in question. That all significant expressions have meaning in a sense which meets these two requirements, might well be doubted, in advance of investigation, on almost any epistemological theory. In particular, whether terms of universal applicability and analytic statements whose falsity is not logically possible, have such sense meaning, is precisely the question which we wish here to approach. But that in the case of most terms and statements, there must be some criterion in mind. in grasping their meaning, which would determine applicability or truth by way of sense-presented characters, is too obvious a thesis to be denied by anyone. Whoever approaches an empirical situation with intent to apply or refuse to apply an expression, or assert something as evidenced or its falsity as evidenced, must -- if he knows what he means -- be somehow prepared to accept or reject what he finds as falling under or confirming what he thus intends. Otherwise applicability could never be determined at all, and there would be no such thing as apprehensible empirical fact or empirical truth or falsity. 3. It will, however, be necessary to observe also what the requirement of sense meaning does not demand, lest a too narrow significance, militating against the usefulness of it, should be imposed upon this conception. First, the supposition that an expression has sense meaning does not require that whether it is satisfied or met in a particular instance should be immediately obvious or even that it should always be determinable. That a presented object has length, and that the notion of length has sense meaning, does not require, for example, that we should be able to tell what the length of the thing is with no meter stick at hand. Nor does the fact that a thing observed has color, and that this color of it is sense-determinable, imply the possibility of such determination under poor illumination. As the operational conception emphasizes, conditions for determining applicability and empirical truth do not always exist ready-made but more characteristically require to be sought out or created. Indeed we may note that there is no conception the applicability or inapplicability of which is always determinable, whatever the conditions. And the more important or the more precise the meaning in question, the more likely it is in general that the conditions requisite for determination are exceptional rather than the rule. Inasmuch as this is true, the criterion of applicability or of truth will require to be phrased in hypothetical terms; If such and such conditions are satisfied, then the finding so and so will determine applicability or truth. And that the conditions of the hypothesis are not in a given instance met, argues no unclarity and no lack of sense, specificity in the meaning in question. The practical difficulty in the way of determining by experience whether there are mountains on the other side of the moon, in no wise militates against the sense-meaningfulness of the assertion of them. Such difficulties have no relevance to the criterion in mind and the clarity or unclarity of it. And it is such clarity of the criterion alone which this mode of meaning demands. Nor is it requisite to sense meaning that the question of applicability of our meanings should ever be categorically determinable. (This is a point which will need further consideration when we come to investigate the bases of empirical knowledge in Book II.) The more careful we are to be accurate in formulating the requirements for complete corroboration of what we mean, the more apparent it will become how infrequently (if ever) we can attain to empirical certainty. Even if we should be forced to the conclusion that no empirical matter ever reaches the stage of theoretical certainty, beyond which further evidence could not possibly weigh for or against it. still that would argue nothing against the sense-specificity of our criterion in mind, provided only we should be capable of recognizing what would be further evidence for and what would be further evidence against the conclusion that the term applies or the statement in question holds. This last proviso, however, is essential: so far as we should be unprepared to recognize further corroboration if we should find it, the meaning in question must be -- as sense meaning at least -- in some part or measure indeterminate and calling for some removal of this indetermination as a clarification of the meaning in question. In short, sense meaningfulness of an expression does not require even theoretical possibility of decisive verification of its applicability in a given instance; but it does require that there be no theoretical limit of possible confirmation. Sense meaning obviously could not be identified with denotation, and is in no wise dependent upon existence, of what is meant. Some theories in which application and verification and empirical tests are emphasized as essentially connected with meaningfulness have tended to identify the mode of meaning in question with denotation. But this would appear to reflect some confusion of thought. Sense meaning as crtterion, is independent of any question of existence or non-existence of that to which the criterion applies. The fact that there are no centaurs has no bearing on the meaiiingfulness of 'centaur': we should recognize a centaur if we saw one; and that fact proves the term to have sense meaning. Comprehension and sense meaning are coterminous; but denotation and sense meaning are not. If intension can be taken universally as sense meaning, then terms which have zero intension and are applicable to everything thinkable must have such meaning, as well as terms which have universal intension and apply to nothing which is consistently thinkable. Also analytic statements, whose comprehension is universal and their intension zero, and self-contradictory statements which have zero comprehension and universal intension, must have sense meaning, if intension and sense meaning are, coterminous. In these cases, one might well think that intension is revealed as a purely linguistic mode of meaning, having no empirical reference whatever and no significance of anything identifiable in terms of sense. But before discussing that topic, we should give more adequate attention to the nature and properties of linguistic, meaning. 4. There have been some students of analysis who have declared themselves to be radically empiricistic, but at the same time have told us that philosophy has nothing which it can legitimately offer except logical analysis; and also that analytic statements lack any sense significance, and investigation of them must be by way of linguistic study and semantics. It would be doctrinaire to deny to students of philosophy the privilege of speculation upon the broader and more general aspects of problems the investigation of which belongs principally to the natural sciences: particularly so with respect to those aspects of such problems which concern the fate of human interests in this world and the validity of human values. But perhaps we should all recognize some justice in the conception that the peculiar business of philosophy is with those problems which are resolvable by reflection, and neither require to be determined nor could be determined by empirical procedures. One essential concern of philosophy at least is analysis and the determination of analytic truth. But the conception that such analytic truth is a primarily verbal matter, concerned with the expression of facts rather than with any matters of fact to be expressed; and that analytic truth is cut off from any direct bearing upon problems affecting human life more vitally than through our use of language; is one which we shall less easily accept. We should do ill, however, if we failed to appreciate how widely this conception of meaning in general as linguistic can be extended, and how nearly adequate to the whole range of problems of analysis it can be made. When the intensional meaning of a term is taken as a test-schematism and an anticipated result of it, or when it is conceived in any other manner as a criterion of application which can be entertained in advance of the particular occasions of application, we have meaning in a sense in which it is essentially independent of the use of language. Such meanings-in-application represent something which even a creature without the language habit would have to entertain in order to use his intelligence for the successful conduct of life. But when the intensional meaning of a term, 'A', is taken as correlative with and exhibited by the totality of predications which are entailed by the predication of 'A', and the intension of a statement as correlative with the totality of its deducible consequences, then we have meaning in a sense which can be construed as exclusively linguistic, and which may be taken as independent of any question of empirical application. Even if applications be considered, they may be thought of as derivatively determinable from linguistic relationships and the rules of linguistic consistency -- as, for example, that when 'A' by its definition entails 'B' we shall not apply 'A' to anything but refuse to apply 'B'; and when 'q' is by linguistic relationships derivable from 'p', we shall not under any circumstances assert 'p' but deny 'q'. Thus one may take meaning as basically determined from definitions and other linguistic rules. And if applications be considered at all, still any question how connection is to be made between language and the empirical occasions of application and assertion, may be set aside as not the kind of question with which logic and analysis are necessarily concerned. Thus meaning as linguistically determined may be thought of as capable of standing on its own feet, and as independent of any sense-recognizable characters associated with it in anybody's mind or any test-schematism by which empirical application of it should be determined. And problems of analytic truth may be taken as resoluble without going outside the circle of linguistic relationships determined by linguistic rules. Particularly, one's attention may be directed to meaning in this sense of linguistic pattern in contemplating abstract deductive systems. Here the terms originally assumed will be 'undefined'; and other terms, introduced by definition, will be assigned a meaning only in the sense of stipulated relation to these undefined terms. The whole set of such terms, defined and undefined together, will have only such meaning as accrues to them through such definitive relationships to one another and through some set of further postulated relations which limit the possible interpretation of them. Within such an abstract system, the terms used will have meaning only to the extent and in the sense determined by the complex pattern of analytic relationships, originating in stipulations of linguistic usage and exhibited in extenso in the system itself as deductively developed. 5. If we think of the meaning of words and expressions only as something specifiable in terms of other words and other expressions, then it must strike us that all use of language has somewhat the character of such an abstract deductive system. If in expressing the meaning of a word, we can only use other words to express it, then either we must be led back eventually to words which are not defined and whose meaning is, so to say, anticipatory of later introduced relationships to other terms, or we must recognize that determination of all meanings involved in a system of language must be mutual, and can consist only in the pattern of their analytic relations determined by the stipulations of linguistic usage. Linguistic meaning must be in this sense eventually circular, and can be identified only with the network of relations in which any expression in question stands to others. However, this might be said to be, not so much an observation about the nature of meaning, as observation of a predicament characterizing the attempt to express meaning. We must express meanings by the use of words; but if meaning altogether should end in words, then words altogether would express nothing. The 'language-system' as a whole would 'have no interpretation', and there would be no such fact as the meaning of language. This observation is, of course, essentially just. Meaning as language-pattern, abstracts altogether from that function of language by which it empirically applies. Precisely what is omitted in such conception of meaning as linguistic, is intension as criterion of classification and as determinant of those characters by which the sensibly presented may be recognized and made intelligible. The linguistic meaning of 'red', for example, is its meaning in a sense which can be conveyed to the man born blind as easily as to another. Sense meaning, however, as the criterion of application, can be expressed in words; indeed, we may say that this is what words do express; but it cannot be literally put into words, or exhibited by exhibiting words and the relations of words. Such patterns of linguistic relation can only serve as a kind of map, for location of the empirical item meant in terms of sense-experience. If there wery no meanings in the mode of sense meaning, then there would be no meanings at all. Psychologically and cognitively, meaning altogether is derivative from the sensuous criteria of recognition. We have first -- first in importance at least -- certain matters before our minds as presented in experience, or as represented; and the whole business of language -- perhaps of thinking also -- arises from the desirability, or the necessity even, of signalizing such empirically presented and preventable items. The analytic structure of our linguistic patterns is a character of the edifice which rises from the foundation of meanings in the prior sense of empirical content and criteria of empirical recognition. Further, any usefulness of our linguistic patterns consists eventually in their guidance of our identifications of the sense-recognizable so as to conform these to our intentions and render them consistent. Meaning in any sense is something entertained for the ultimate purposes of accepting or rejecting, identifying and.classifying. In order that linguistic repressions should function for guidance of such ways of acting, there mus be, correlated with words in our minds a meaning which cannot literally be disclosed by any use of words or any inspection of words and their relations. Nevertheless there are many problems consideration of which does not require that we should go beyond the linguistic patterns themselves. As the reference, above, to deductive systems may serve to suggest, many problems of logic and analysis are such. In fact, if logic be straitly enough conceived, all questions of logic can be successfully dealt with in terms of linguistic meaning alone and without reference to any correlated sense meaning. Logic so conceived need never be concerned with any question of what is and what is not empirically presented or presentable, or with any representation or schema for the recognition of things. It will not matter, within such logic itself, what imagery may be associated with language used, in anybody's mind, provided only consistency be preserved. Indeed logic could be dealt with as if it concerned only the discourse of disembodied spirits in an empirical vacuum (if that leaves discourse possible), who contemplated nothing beyond their own verbalisms, but who, for some unmentioned reason, conformed their verbalizing to certain rules. It would not be essential that these rules should be matters of agreement; or even that there should be communication at all. Each could discourse to himself in ways of his own, and about nothing but his own discoursings. If he discoursed by reference to rules, there would be consistency or inconsistency, deducibility, and logic. We ordinary mortals would, very likely, be irked by the spectacle of such beautiful souls, and minded to make a few sentences to end sentences about sentences; but this emotional reaction of ours would be irrelevant to the integrity of their occupation in weaving intricate and admirable logical patterns for their own contemplation. The possibility of setting off linguistic meaning, by abstraction from all connection with sense-application, is genuine -- and need not be fantastic. And the possibility of restricting logic and the theoretical treatment of analytic problems generally to what concerns such linguistic pattern alone, is likewise genuine. The possibility of such rigorous analytic developments, by 'mathematical' and 'meta-mathematical' procedures, may constitute one motive for this abstraction of linguistic meaning from all sense-application. Logic can avoid all reference to the applications of words, beyond the vocabulary of logic and syntax itself. The assertion that it does deal thus exclusively with relations of linguistic expressions would, of course, be dogmatic; the announcement of a methodological stipulation as if it were some kind of objective fact. Just at what point restriction of the subject-matter of a discipline represents a useful separation of problems, and where instead it will militate against the usefulness of that discipline, is primarily a question of the purposes to be met. And that such usefulness of analytic developments does not necessarily dictate inclusion of problems of application, is something that mathematics and the history of it more or less make evident. It should go without saying, however, that since the use of logic is not for the esthetic satisfaction which may be found in the formal patterns of it, but for the attainment of consistency and validity in thinking; and since thought is for the guidance of action in the face of experience; reference to sense, if omitted in logic itself, must at some point in the applications of it be restored. There are few questions which are quite unaffected by the use of language; but to suppose that all problems of reflection, or even those appropriately included in philosophy, are capable of solution by reference to linguistic considerations alone, would be too extreme a view to be considered. 6. There is a further possible motive for the discrimination of linguistic meaning from all sense meaning, which may be found in the different bearing of these upon the problem of meaning as communicable and as something this community of which should be verifiable. Assuming that it is essential to the meaningfulness of a linguistic expression that one who uses it should have in mind some criterion of its application, still it is not clear that two persons who use the same language and 'understand each other' by means of it must necessarily have in mind the same thing. It is essential, if the purposes for which language exists are to be met, that they should signalize the same objective realities by the same language. But it is not clear that presence of the same objects is, or must necessarily be, signalized to different individuals by qualitatively identical presentations in their experience. Hence use of the same expressions in the presence of the same objective facts does not necessarily imply the same sense-criteria of application. So far as the schematism of application involves overt behavior, common meaning presumes community of such test-routine; but so far as it is some observed resultant which must determine the decision, it is not evident that use of the same terms on the same occasions indicates that the same sense meanings are in mind. And even supposing sense meanings to be common, still it is not clear how such community could be verified. Thus the notion of sense meaning, as criterion in mind which determines application, may be objected to as involving reference to the unverifiable and ineffable. It may be thought that such questions can be obviated, or at least put over to another context, by treating meaning exclusively as linguistic. That is, it may be thought that there is methodological advantage at least in taking intension as linguistic meaning, because in the case of another person linguistic usage is a part of his directly observable behavior. But if such confinement of problems dealt with to what is verifiable by direct observation should be any part of the motive for preferring to treat meaning in general as linguistic rather than as sense meaning, then it should be pointed out that any supposed advantage in this respect is illusory. There is the same possibility of taking meaning exclusively in terms of an objectively observable correlate in the one case as in the other. And in either case, community of meaning, as between different persons, must rest upon inductive evidence and can hardly attain to theoretical certainty. We have thought it well judged to take sense meaning as criterion in mind; but the important character connoted by 'in mind' here is 'entertained in advance of instances of application which are pertinent' rather than any necessary contrast between what is in mind and what would be describable in terms of overt behavior. Common-sense reference to meanings as something 'inwardly observable' when entertained, with an assurance exceeding any which outward observation of another could give, has indeed been intended. But if anyone conceive it important to exclude what is thus inwardly observable only, then that aspect of the matter is dispensable. One may consider such criteria of application, as meanings entertained in advance, in terms of incipient behavior or behavior attitudes if one choose; and the observability of these will then be comparable to the observability of the use of language. The real point is the distinction between meaning as indicative of and indicated by application on the one hand, and on the other, meaning as relation not to objects and objective occasions but to other linguistic expressions. And whichever of these two aspects of meaning one would emphasize, it will be essential to that clarity and precision required in logic and like problems, that a meaning should be something which is determinate beyond what any number of observed occasions of the use of expressions will assure with theoretical certainty. No classification can be completely fixed by observation that such and such items are accepted as subsumed under it. Always theoretical alternatives with respect to instances of some specifiable type, not yet examined, will remain over, and leave any criterion of the classification in like measure indeterminate -- this quite apart from any question of the persistence of behavioral attitudes observed to date. And likewise in the case of meaning of a term as exhibited by, let us say, accepted relationships of synonymity. As the illustration of the Arabic dictionary may make evident, one does not determine linguistic meaning with precision by observation of a single accepted synonym, unless the further linguistic relationships of that synonymous expression are already fixed. For theoretical determinateness of linguistic meaning, complete classification of all pairs of expressions as synonymous or non-synonymous would be required. And observed occasions of another's linguistic usages are as insufficiently indicative of this as are observed occasions of application for fixing the criterion of application thus exemplified. In either case, our evidence of what another person means, in the mode of intensional meaning, can be inductive only and will fall short of theoretical certainty. Whether we have better assurance of our own meanings, and if so on what ground, is perhaps a question just as well omitted. As what we intend at the moment at least, a meaning seems to be as open to direct examination as anything we are likely to discover. 7. In any case, between intension as linguistic relationship and intension as sense reference, there is a necessary and obvious connection which derives from the function of language itself. Terms in general denote things and signify characters of them, and statements are intended to express facts. If there are expressions which are empirically vacuous, still these are thoroughly bound up with others having concrete meaning. In consequence, there must be correspondence between these two aspects or ways of taking intensional meaning, unless some correction is needed either of our definitions and other accepted analytic statements or of our ways of determining applications of expressions. Linguistic pattern of analytic connections may be abstracted, temporarily or from some limited point of view, from all relation to the concrete, and considered only as logical or 'syntactic' or systematic structure of symbolisms awaiting specific interpretation. But if we are to avoid the fantastic, then at some point the empirical reference of language must be restored. Definitions must express criteria of application, and analytic statements must limit the allowable modes of classifying and designating. We must define our terms conformably to our applications of them; and we must apply them conformably to our definitions. We can, so to say, start from either end of this relationship, but eventually the connection must be made. To an extent at least, we can set up analytic relations of linguistic expressions -- more accurately, of linguistic symbols -- by convention and arbitrarily. But having set them up, we must then respect them in any interpretations or applications. If our definitive conventions and postulated linguistic relations are not bound by antecedent fact, at least they are resolutions binding on our further practice. They limit our later freedom to make other and similar conventions; and they limit also our freedom to interpret and apply. Validity requires not only consistency of what we say with what else we say, but also consistency of what we say with what we do. Or, on the other hand, we can start from sense-recognizable characters, taken as essential for the application of terms and as constituting ourcritena of classification. And then we shall find the allowable modes of definition and the truly analytic relationships determined by the fact of the inclusion of one test of application by another; the entailment of one essential character by another, or the incompatibility of one sense apprehensible character with another. The question which ot these two aspects or ways of construing intensional meaning is the more fundamental, and which is derivative, should find a partial answer at least from consideration of another question: Does language exist, in general, for the sake of signalizing characters found in things and for the sake of practice guided by sense-apprehension; or are classifying, naming and relating things, activities which go on for the sake of supporting a language habit and exemplifying concretely our chosen forms of syntax? Insofar as the problems in which we are interested are the epistemological ones, the final and finally important consideration is the fact that interpretation of meaning as linguistic significance can afford no sufficient clue to the determination of analytic truth, whereas interpretation of it as sense meaning may indicate an obvious source and criterion of it. The only origin of the analytic and a priori character of some statements, as contrasted with the synthetic and a posteriori character of others, which is suggested by reference to linguistic usage, is the fact that the former class of statements are certifiable, eventually, from definitions, together with the rules of logical transformation and derivation. Probing further as to the independence which such definitive and logical formulations have of all empirical matters of fact, the only explanation which can be found for this in meaning as linguistic, lies in the conventional character of definitive statements as stipulations of linguistic usage and in the similarly stipulative character of logical principles as supposedly derivative from definitions and formulations of accepted syntactic usages. Admitting the accuracy of the considerations thus evoked, and admitting the possibility of treating logic as simply derivative from definitive and syntactic formulations, the shortcoming of such explanation is simply that it does not explain what needs to be explained. It affords no clue to the a priori character of analytic truth as independent of empirical fact. It explains this independence, but it accomplishes this explanation by divesting analytic statements of any character of truth: or at least by abstracting from any character of analytic statements by virtue of which they could be either true or false. As has been pointed out, no definitive statement can be at one and the same time stipulative and the expression of any kind of fact. Considered as linguistic conventions, definitions are either resolutions or hortations (genuinely stipulative) or they are merely empirical statements of actual or intended usage. Furthermore, neither stipulations nor empirical facts of linguistic usage can in any wise determine or affect a relation of meanings -- in any good sense of the word 'meaning'. The use of symbols is subject to stipulation, and the representation of a given meaning by a particular symbol is likewise subject to stipulation. And the customary or good usage of symbols as substitutable for one another, and as conveying certain meanings, is a matter of empirical fact which can be reported. Likewise the expression of a certain relationship by a certain syntactic order or other manner of speaking and writing, is subject to stipulation; and actual usages of this sort are matters of empirical fact. Without definitive and syntactic conventions, there would be no connection between meanings and symbols, and no connection between order of symbols and relations of meanings. The mode of expression of any analytic truth is thus dependent on linguistic conventions; as is also the manner in which any empirical fact is to be formulated and conveyed. But the meanings which are conveyed by symbols, on account of a stipulated or a customary usage of them, and the relation of meanings conveyed by an order of symbols, on account of syntactic stipulations or customary syntactic usage, are matters antecedent to and independent of any conventions affecting the linguistic manner in which they are to be conveyed. And nothing in the nature of a truth to be told (or a falsehood) puts in its appearance until the linguistic symbolisms used have a fixed and understood meaning assigned to them, or until the syntactic structure of the kind of verbalism called a statement conveys an equally fixed and understood relationship of meanings symbolized. There is no statement of any truth, analytic or otherwise, until a relation of meanings, in some mode of meaning, is asserted. The manner in which any truth is to be told by means of language, depends on conventional linguistic usage. But the truth or falsity of what is expressed, is independent of any particular linguistic conventions affecting the expression of it. If the conventions were otherwise, the manner of telling would be different, but what is to be told, and the truth or falsity of it, would remain the same. That is something which no linguistic convention can touch. Until the conventions affecting expressions are fixed, and hence the meanings in question are fixed, literally nothing is said by any string of symbols. And when the conventions and the meanings are fixed, the truth of what is said depends, not on the symbolizations, but on the meanings symbolized. It is quite true, as we have tried to indicate, that matters of logical construction and derivation, such as the deduction of the theorems of a mathematical system from definitions and postulates, can be reduced to the status of a kind of glorified chess-game, with symbols as the pieces and definitions and rules of the syntactic type as the chess rules governing allowable moves to be taken in deriving theorems. And what end-results can be obtained by such moves according to the rules, is as sternly limited in these terms as in terms of deducibility considered as a consequence of meanings and assertions. There are even purposes which are well served by reducing deduction and system-building to this chess-game status. But we should be more careful than will come about naturally and easily to separate clearly what belongs to the chess-game from what belongs to establishment of any analytic truth, in spite of the kind of point for point correlation which may exist in such cases. The result of the symbol-game with syntactic rules does not say anything, any more than does the result in a game of chess. Until meanings are assigned, there is no kind of truth in question -- or only the truth of what you can do by allowable moves with certain pieces of symbolism. And once the symbols represent meanings, the substitution of symbols and other allowable moves must be carefully governed from respect for the truth, in terms of these meanings; otherwise, it will be a very poor game with a negligible result. 8. What lends plausibility to this conventionalist interpretation, which finds no significance in analytic truth beyond the significance of linguistic conventions of definition and syntactic usage, is the fact that, in a sense which has been discussed, all analytic statements say the same thing and say nothing. With respect to empirical matters of fact, their significance is vacuous, requiring no particular matter of fact which has any empirical alternative, and forbidding none. But as has also been observed, it is with respect to their intension considered holophrastically only, that all analytic statements have the same meaning and are thus vacuous. Considered analytically, as expressions the intension of which is constituted by the intensional meaning of constituents and syntactic order, analytic statements say different things, and what they assert is something certifiable by specific relation of the specific meanings of their constituents -- which in general are not empirically vacuous meanings. "All cats are animals" asserts a relation of the intensional meaning of 'cat', which is neither zero nor universal, to the intension of 'animal', which likewise is neither zero nor universal. Or else it asserts a relation of the two classes, which relation can be known to hold a priori by considering the relation of the intensions of 'cat' and 'animal'. So that whether this statement, as intended, affirms a relation of classes and is implicitly analytic, or affirms a relation of intensional meanings and is explicitly analytic, in either case it is this latter relationship which must be known if the statement is to be determined as analytically true. That is, we can apprehend the analytic truth of "All cats are animals" only by knowing "All cats are necessarily animals." The epistemological question about analytic truth relates to the nature of this necessity and how we know it. The conventionalist answer has the merit of pointing out that this is not a necessity arising from any force of nature, or from any empirical state of affairs. It is not a physical or biological or otherwise natural necessity. Nature may be anything conceivable, and the forces of nature anything imaginable, but still there would be no possibility of a non-animal cat. But if it be alleged that this necessity arises from our linguistic conventions as to the use of the expressions 'cat' and 'animal' and 'all' and 'are', and the syntactic usage affecting the expression "All cats are animals," then it is at least obscure just what may be meant by 'usage' here, and we shall not, in fact, find any answer to our epistemological question by looking to linguistic meaning and to usage in the sense of conventions of language. The question whether "All cats are animals" is analytically true, or "Some rats triangles bite" is analytically true, cannot be determined without reference to conventionally determined use of words and of syntactic order in making statements. If the expression 'rats' (more accurately, the symbol «rats») was used as in fact 'cats' is used, and 'some', 'triangle' and 'bite', as in fact 'all', 'animal', and 'are' are used, and if the conventions of syntactic order were those of statements in German, then "Some rats triangles bite" would be analytically true. And if 'cats' were used as in fact 'rats' is used, and so on -- the reader can fill out the rest of the illustration -- then "All cats are animals" would not be analytically true. It is neither the linguistic symbolisms nor their conventionally determined relations to other symbolisms nor the conventions of syntax, which determine any analytic truth. These determine only the manner of the expression of it; and it is what is expressed which is analytically true or not. Something which is expressed by 'cat', but might be expressed by 'rat', has to something which is expressed by 'animal', but might be expressed by 'triangle', a relation which is expressed by 'all-are' but might be expressed by 'bite'; and the whole fact so expressed is determinable as true independently of any appeal to empirical fact. It is this status of analytic truth attaching to what is thus expressed, no matter how it is expressed, which is the epistemological question. And conventions of definition and syntax afford no answer whatever to that question. 9. The answer is to be found by reference to the sense meanings of 'cat' and 'animal'; by reference to the criteria according to which we apply or refuse to apply these expressions to things. The sense meaning of expressions having zero intension is vacuous. It would be subtly incorrect to say that they have no sense meaning, because in understanding what they mean we understand something by virtue of which we are aware, in advance of any particular experience, that whatever this experience presents will be compatible with what this expression requires. If 'either not square or else rectangular' had no criterion of its applicability, then we should never know whether it applied or not, instead of knowing that it always will apply. Still an expression of this kind lacks sense significance of the kind which its constituents 'square' and 'rectangle' have. This knowledge of its universal applicability derives in fact from grasp of the sense meaning of these constituents, and of the significance of 'not' and 'or' in constituting this holophrastic sense-significance of the whole expression. What we know in advance of any particular occasion is that by virtue of the criterion of applicability of 'square' and of 'rectangle', 'not a square or else a rectangle' will always apply. We do not require examination of particular instances, because a sort of experiment in imagination is sufficient. 'Round square' has the opposite kind of lack of sense significance: it never applies; we cannot imagine anything satisfying it. But this lack of significance attaches to its intension as holophrastic: the constituents 'round' and 'square' have specific sense meanings such that they sometimes apply and sometimes not. And the relation syntactically expressed between 'round' and 'square' prescribes a certain manner of relating the senses of 'round' and 'square'; the same manner of relating them as is prescribed for 'red' and 'square' in determining the sense meaning of 'red square'. And the phrase 'round square' does not lack sense meaning in the manner in which such an expression as 'ectoplasm' would: we are not at a loss just how to test its applicability, but know quite well what test would be in question; and it is from that apprehension of what a thing must be in order to satisfy 'round square' that we know, in advance of any experience, that it will never apply. The experiment of trying to put together in imagination the sense meanings of 'round' and 'square' in the manner prescribed by the syntax of the phrase, is sufficient: to assure this universal non-applicability a priori. 10. It is this kind of fact about the relations of criteria of application of expressions to one another which is pertinent to our assurance a priori of the truth of analytic statements, as well as our assurance a priori of the falsity of statements which are self-inconsistent. Because what any explicitly analytic statement asserts, when we consider the intension of it not merely holophrastically but analytically, is some relationship of intensional meanings of constituents in it. And in general, these constituent intensions will be neither universal nor zero: nothing can be said by using exclusively expressions which always apply or which never apply. And if the statement in question is implicitly analytic only, and does not assert a relation of intensions of its constituents but something else, still in order to know it true analytically and a priori, what we must know is the truth of the corresponding explicitly analytic statement, which does assert such a relationship of intensional meanings. We know that "All squares are rectangles" because in envisaging the test which a thing must satisfy if 'square' is to apply to it, we observe that the test it must satisfy if 'rectangle' is to apply is already included. This experiment in imagination -- which we must be able to make if we know what we mean and can recognize squares and rectangles when we find them -- is sufficient to assure that the intensional meaning of 'square' has to that of 'rectangle' the relation prescribed by 'all-are'. This kind of fact, conveyed by an analytic statement, is obviously one whose holding or not holding is independent of what anyone would choose to have it or happens to be convinced of. Taking these sense meanings apart from any question of their verbal expression, a relation of them is as much a brute fact, unalterable to our wish and will and obdurate to any decision or convention of ours, as is the fact that trees have leaves and rocks are hard. In this sense, the facts of logic and of mathematics are as fixed and unmanipulable as are the facts of physics or the fact that you can't put a bushel of apples in a peck measure. It is this kind of fact which makes the relation of two expressions, each signifying a specific character of things, either true or false, independently of the verbal symbols of the two expressions or of the syntactic conventions affecting statement of the relationship. This is the more fundamental significance of analytic statements, in which what they express would be a matter of concern to any intelligent creature even if he lacked the language habit altogether. Such a creature would still, by virtue of what is involved in intelligence, make classifications and recognize what belonged under each by some specific and perceptible character. The relation of one such character, operating as criterion, of classification, to another, would likewise be a matter of intelligent concern, in the interest of obviating unnecessary question of the direct relation of empirical factualities, when such relationship could be antecedently determined by reference to the recognizable characters operating as signals of their classification. The fact that it is uneconomical and unintelligent to wait upon particular empirical occasions in order to discover whether what is square is also rectangular, or whether a peck measure will hold a bushel of apples, has no dependence on linguistic usage, but springs from the antecedent connection of what, as it happens, is signified by the words 'square' and 'rectangular', 'peck' and 'bushel'. That the verbal expression "All squares are rectangles" conveys a logically necessary fact, could not be determined in entire independence of what the constituent expressions 'square' and 'rectangle' convey, but the fact of the relation expressed by "All squares are rectangles" has no dependence upon our conventions of expression or even on the existence of language. No manner of devising a system of language could affect it, and no decision of ours could make it otherwise than it is. 11. The compatibility or incompatibility of sense-recognizable characters, and the inclusion, of one in another or its exclusion by another, is thus the root of the matter. A priori statable truth arises when characters so related are made the basis of classification and of the application of linguistic expressions. That what is asserted by an analytic statement is knowable in advance of particular occasions and incapable of being adversely affected by any empirical finding, reflects the fact that it is a relation of classifications and their criteria which is in question. If the test for the property or character A and that for the property or character B are so related that in satisfying the former anything must also satisfy the latter, this relationship can be discovered without raising any question of what in particular satisfies or fails to satisfy either test. And what is thus discoverable by examination of criteria cannot be upset by any fact of existence or non-existence or any disclosure of experience. If the positive result of a test for A includes positive result of a test for B, then the facts of reality or experience may, so to say, be anything they like, but they cannot conceivably present us with a case of A which is not a case of B. These ways in which we classify phenomena impose no limitation whatever upon what shall exist to be classified or what shall present itself in experience. And conversely, what particular phenomena are actual or are presented, can impose no limitation on the sense-recognizable characters by which we may choose to make our classifications, provided only we adhere to our own criteria as fixed. The question, "Does your schematism for determining application of the term 'square' include your schematism for applying 'rectangle.'?" is one determined in the same general fashion as is the answer to the question, "Does your plan of a trip to Chicago to see the Field Museum include the plan of visiting Niagara to see the Falls?" A test, like a plan, must be sense-recognizable when carried out. And like a plan, it must be capable of being envisaged in advance. If the plan lacked sense-apprehensible character as envisaged in advance, then we should never know whether we were following it or not, nor whether what happened satisfied it or not. Similarly, if a criterion of the application of a linguistic expression lacked sense-significance, we should be unable to determine in any given case whether the factually presented conformed to it or not. A criterion, like a plan, is determined antecedently to apprehending anything which satisfies or fails to satisfy it, and whatever happens or fails to happen when we apply it does not alter or affect this criterion itself. And a relation of criteria, which an analytic statement may formulate, is a sense-apprehensible relationship, like the inclusion of one plan in another, or the incompatibility of them. In whatever sense we can say that criteria of application could be only in a mind, a relation of them could likewise be only in a mind, and is not an out-there fact. But it is dubious to say that a test-routine and the sense-apprehensible result of it could be only in a mind: the pertinent point is that, taking it as a basis of classification, a routine and a positive result of it are entertained hypothetically only, so far as any particular occasion of experience is concerned. The antecedent decision to include things in a classification, or exclude them from it, according as this test is satisfied or not, is something beyond the power of any out-there circumstance adversely to affect. However, in believing or asserting our criteria to have certain relations, we can make mistakes -- though no mistake which is not intrinsically possible of correction merely by taking thought upon the matter. Every student of logic or mathematics discovers this, to his sorrow. The only reason that there are not false analytic statements as well as true ones is that we do not classify statements of relations amongst our meanings or criteria as analytic when the asserted relationships do not in fact obtain. It is thus that what analytic statements affirm falls properly under the head of knowledge, and has a significant opposite in a kind of possible error, even though it is a type of knowledge which can be assured a priori and independently of any existential fact or any particular empirical presentation. 12. Let us sum up this matter, in conclusion. There are three factors involved in determining analytic truth of any statement; two of which are subject to convention, though in ways which are different, and one of which is not amenable to any decision we can make. First, there is the manner of linguistic expression. The ways of conveying meaning by the use of verbal symbols are fixed by convention, and no statement could be determined as true or not, or as analytic or not, without reference to the verbal expression of it. But while relations of symbols to symbols, determined by what we have called a symbolic convention, may dictate that whatever is symbolized in a certain way may also be symbolized in a certain different manner, and may forbid the symbolization of anything in one fashion unless it can be symbolized also in another, relationships so set up determine no truth except in the oblique sense of determining a relation of whatever meanings are conventionally symbolized in such and such a manner. Until symbols have fixed and specific meanings, a relation of them conveys no relation of meanings; and as soon as the meanings attaching to symbols are fixed, the question whether a relation of symbols expresses truth depends upon the relation of the meanings so expressed. Also, there would be these relationships of meanings which hold, whether they be verbally symbolized or not, and irrespective of the manner of their symbolic representation. Thus the conventions of laneuage determine no analytic truth but only how it may be expressed. They are a factor in the analytic truth of statements only because correct expression of a relation which holds is essential to the truth of statements. Second, there is the factor constituted by our ways of classifying, according to criteria of our own choosing. Every expression having fixed meaning signifies some testable and recognizable property or character which is the essential mark of its applicability. What such characters we choose to note, or find it important to note, is a matter of decision; and in that sense what meanings we shall entertain and express, amongst all those which could be entertained and expressed, is conventionally determined. These criteria of the application of expressions, entertained in advance, or hypothetically with respect to any empirical occasion, constitute the intensional meanings of expressions we choose to apply. The intensional meanings may also be indicated by relations of the expression in question to other expressions. But this linguistic meaning must be in accord with the criteria of application of the expressions so related. And it is only by virtue of a reference beyond verbal expressions altogether, to what concerns the possible application of them, that there is such a fact as the meaning of language in general or a specific meaning of any expression, however related to others. When meanings in the sense of criteria of application have been assigned to verbal expressions, the relation of the verbal expressions can no longer be determined or affected by any decision, but depends on the actual and discoverable relation of these criteria themselves. The root of the matter thus lies in the third factor; in the relations of testable and sense-recognizable characters which are our criteria of classification and of the application of verbal expressions. One such essential property signified may include or entail another; as the criterion of squareness includes the criterion of rectangularity. and the applicability of 'cat' entails the applicability of 'mammal'; and one such may exclude another as incompatible; as satisfaction of the test of squareness excludes satisfaction of the test of circularity, and as applicability of 'cat' excludes applicability of 'fish'. It is in such relations of sense meanings which are taken as criteria of the application of expressions that the determination of analytic truth is finally to be found. Such relationships are as they are, and are not subject to any convention or decision. They are capable of determination, in advance of and independently of any particular occasion on which expressions apply or fail to apply, through that envisagement of the criteria of which we must be capable if we know what we mean in the sense of being able to recognize an instance of it when we find it. An analytic statement has itself no specific criterion of its applicability beyond what determines that it could not fail to be satisfied under any circumstances. It has zero intension, imposing no limitation, and being applicable to any conceivable world regardless of what particular matters of empirical fact are contained in it. But this zero intension can be determined only by grasping this holophrastic significance of it as constituted analytically by the relation which it asserts to hold between specific meanings. Either it affirms a relation of intensional meanings of constituents in it, which relation is certifiable by reference to these intensions as sense meanings; or it asserts a relation of constituents in some other mode of meaning such as denotation, but one which can be assured -- and can only be assured in advance of particular empirical occasions -- by assuring a corresponding relation of intensional meanings. It is in this sense that we are able to determine the truth of any analytic statement if we understand what we mean by it. 13. This essential connection of verbal expressions which have meaning with some criterion of their possible application or truth, is also the consideration which is fundamental for the question whether there are any synthetic a priori truths, or whether all statements whose truth can be known independently of their confirmation by particular experiences are analytic. It would hardly be desirable to enter at length upon that question here: it is a dead, or nearly dead, issue; conviction that all a priori truth is analytic being now quite general. On the other hand, there is no equally general agreement upon any premises sufficient to support that conclusion; and brief consideration is worthwhile for the sake of side-lights which can thus be thrown upon other questions with which we are more nearly concerned. The impressive historical expression of the belief that there are synthetic judgments truth of which is knowable a priori, is the conception of Kant that there are certain limitations of our capacity to receive sense-impressions, and hence of our capacity to represent or imagine, which are not at the same time limitations of our capacity to conceive, and hence are not limitations or conceptual meaning. This doctrine is not quite explicit in the "Transcendental Aesthetic," because it would be paradoxical to attribute to such terms as 'triangle' and 'straight line', a conceptual meaning not limited by the possibilities of intuiting and imagining triangles and straight lines. It would be thus anomolous because such terms name distinctly spatial things; and space and time, as forms of intuition, are set over against the concepts of the understanding. Thus Kant does not raise the question whether mathematical concepts have, like the physical concepts of substance and of cause and effect, a problematical extension beyond the conditions of intuition and representation which limit our possible application of them. He merely notes that the definitions of mathematical terms, plus logic, are insufficient premises for principles such as that the sum of the angles of a triangle is equal to two right angles, and a straight line is the shortest distance between two points. Hence that these propositions must be synthetic; and their a priori certainty must be attributed to conditions of representation over and above what is contained in the concepts. It is in later sections, concerning the concepts of the understanding, that this basis of synthetic judgments a priori becomes quite clear -- though Kant's language is in places confusing, and inconsistent with the doctrine to which he nevertheless commits himself. Let us discuss the questions involved, so far as possible, in terms of Kant's own suppositions. Our possible application of concepts like 'substance' and 'cause' are limited by our schematism of them under the conditions of representation in time. Beyond our capacity thus to apply them in possible experience, they have no meaning for us. (Kant says just that in several passages; and in such passages he uses both the terms Bedeutung and Sinn.) Apart from sense-representation, they are mere 'empty titles' of concepts. Nevertheless they have a problematic extension beyond these limitations of sense-experience. For example, the conceptual significance of 'substance' is merely 'that which is subject and cannot be predicate'. And from this definitive meaning the principle that in all change substance is the permanent, is not deducible. However, this principle of physics has a priori certainty -- so Kant believes -- when the further conditions of a schematism in time, as conditions of application of the concept to sense-things, are added. Thus this principle is supposed to be both a priori and synthetic. Similarly, the principle that everything that happens presupposes something on which it follows according to a rule, is supposed to be a priori but non-analytic. The concept of cause has problematic extension beyond possible sense-experience, and the notion of an uncaused cause is not precluded in the concept, but is -- for natural phenomena -- precluded by conditions of temporal schematism and hence of our possible application of the concept. Thus Kant conceives that logic, and the definitive or conceptual meaning of terms, extend not only to phenomena but also to supersensible or noumenal things which we cannot intuit or represent but still can think. If it be asked how we can give even problematic content and significance to concepts, beyond the realm of sense-things amongst which alone we can genuinely find an application for them, Kant answers by the notion of an 'analogon'. This notion is left quite obscure, apart from the obvious suggestion that an analogon is a kind of unsatisfactory envisagement of something which we cannot adequately represent, through partial analogies of it to what we can experience or imagine. Thus we can vaguely think first causes, such as supersensible free moral agents, and substances which, like God, are not beings whose existence is limited by space or time; and the conceptual significance of 'substance' and 'cause' extends, problematically, to such non-phenomenal entities. The conception is, thus, that terms have a purely conceptual significance, expressible by a definition and not limited to objects of our possible experience but extending to 'things in general'. They have also a sense meaning, which is further limited by a schematism of our possible application of them to empirical objects. This schematism imposes conditions not derivable from the definition of them. Something -- e.g., that every event has a cause -- is supposed to be assured by this schematism of any possible empirical application of the concept (hence to be a priori true of all phenomena) which is not deducible from the definitions or conceptual significances in question (and hence is non-analytic). However, omitting other criticisms which might be made of this Kantian doctrine, we must observe that it commits a fallacy of ambiguity. We have here, not one meaning of terms like 'substance' and 'cause' but two. There is, for example, the broader meaning of 'substance' as that which is subject and cannot be predicate, which (let us suppose) covers not only physical objects and psychological entities but extends to supersensible things as well. This broad meaning does not entail any temporal or spatial character of what is to be called a substance. And there is the narrower meaning of 'phenomenal or natural substance' which does entail whatever is involved in that schematism by which alone we can give the term empirical application. And there is the broader meaning of 'cause' as 'that in the absence of which a thing could not be'; and a narrower meaning, as 'that in the absence of which a phenomenon would not empirically exist or occur'. The broader concept does not entail temporal antecedents and other characters essential to all phenomena, but the narrower concept does. Let it be admitted, for the sake of the argument, that there are such terms which have empirical application but at the same time a conceptual significance which is wider and is not confined by conditions of such empirical application. And let us suppose, with Kant, that there can be some statement "All A is B" such that the conceptual signification of 'A' does not entail the conceptual signification of 'B', but that the representation or schema of empirical application of 'A' does entail 'B'. Now let it be asserted that "All A is B" is a priori, because 'A not-B' is not representable or imaginable; and that "All A is B" is synthetic because the concept of 'A' does not entail 'B'. We then have a fallacy of four terms. Because if 'A' here is not confined in comprehension to the phenomenal but extends also to things in general and in themselves, then the impossibility of representing 'A not-B' proves nothing about the connection of 'A' and 'B'. (And with this, Kant is in agreement: he does not suppose there are synthetic propositions a priori about the supersensible. )6 But if the statement is confined to 'phenomenal A', as it must be in order to be a priori, then it is not synthetic, because 'phenomenal A' entails all conditions essential to A's being identifiable in experience, including whatever is involved in the schema of empirical application of the term. Thus Kant's claim of synthetic a priori truth is plausible only because he did not write in the qualification 'phenomenal' where he nevertheless took it for granted and where it is essential to his argument. For example, if 'whatever happens' connotes temporality of what is spoken of, and if being a temporal happening entails being caused, then "Whatever happens has a cause" is an analytic proposition. But if temporality is not here connoted, or if being a temporal event does not entail being caused, then no ground for holding this proposition to be a priori is revealed. It may be objected that we miss the point: that Kant believed he had established that being a temporal event entails being caused through the necessities of all possible experience and representation, but that this connection is not derivable from the concepts or definitions of 'temporal event' and 'cause'. This objection undoubtedly states Kant's own understanding of the matter. And he conceived that the (or some) entailments which figure in geometrical proof are similarly not logical entailments but such as arise from necessities of sense-representation and all possible experience. But it must be replied here that anything which is essential to the temporal character of an event must be included in the adequate concept of it as a temporal event, and anything without which geometrical entities cannot be recognized must be included in concepts of them as spatial. A definition which does not entail logically all characters essential to what is defined, is faulty. There are some indications that Kant was troubled over this point. Faced with the question whether the concepts of spatial entities must not include whatever is of the essence of their spatial character, he cannot -- as he does in the case of the concepts of substance and cause -- allege a distinction between the merely logical essence or definition and limitations of our possible intuition. He cannot do this because space is exclusively phenomenal. But so too is time; and the same consideration applies to 'temporal happening'. There is some evidence in his writing that, on account of such difficulty, he entertained the thought that space and time, as forms of intuition, are not concepts. But this, if it were to be carried through consistently, would have most disconcerting consequences; e.g., that either space and time do not have essential properties or that these cannot be conceived and are inexpressible; and that either there are no concepts of 'triangle', 'circle', etc., or that such concepts omit the peculiar space characters of these entities. And if this last should be the case, then there would be as much reason to think of supersensible triangles (not limited in conception by the necessities of space-representation) as to think of possible supersensible substances and causes. It would be ungrateful and unjust to blame Kant for not foreseeing that, from genuinely adequate mathematical definitions, the theorems of mathematics might be deducible. Have we such entirely adequate concepts even today? Rather we should thank him for pointing out the indispensability of schemata of sense or construction for our empirical meanings. But however grave our difficulties in achieving analyses which reveal as analytic those truths of which we feel certain in advance of particular empirical confirmations, we must find the alternatives too disconcerting to accept. Suppose, for example, we should think to discover -- as Kant did -- that certain steps of mathematical demonstration are valid only by reference to necessities of space-construction or of the temporal schematism of counting, and do not follow from their premises by logic alone. Then we must think that there is an unexpressed premise, implicit in these necessities of construction, and such that when it is elicited and made explicit, our conclusion will follow by sheer logic. And since this necessity of construction belongs essentially to space-order or time-order, we shall not adequately have defined space-things in general, or temporal entities, until it has been included in the definitive specification of them. Thus when we shall have amended our procedure by correct analysis, our demonstrated theorem will be revealed as a priori because analytic. To this manner of regarding the apparently synthetic character of such a priori truth, we shall have only two alternatives. Either we must suppose that there are characters of all spatial or all temporal things, which we recognize with certainty as essential, but which we are altogether incapable of expressing and including in definitive statements of our concepts; or else we must suppose that in addition to demonstration by reference to logical principles there is a kind of elenchus between premises and conclusion which is recognizable as valid a priori, but valid for no reason which we can ever express as a general rule of deduction. 14. Leaving aside any question of Kant and the correct interpretation of his doctrines, we may see the essential consideration which suggests the impossibility of synthetic judgments a priori. Any character in the absence of which we should refuse to apply a term, is of the essence. It is included in the signification of the term; and any definition which does not entail such an essential character represents a faulty analysis of the meaning in question. Such faults of analysis are fatally easy: almost one can say they are the rule and not the exception. Every logician from Plato down has found occasion to point out how liable we are to accept as definition some formulation which covers readily thought-of instances but fails to elicit and include characters which we should nevertheless require to be present where we apply the term defined. A connection of meaning is recognized as intrinsic; hence statement of it as holding a priori for all things comprehended by the term in question. But our verbal expression of these meanings may omit the ground of this intrinsic connection of them. And thus, through failure of analysis, the appearance of synthetic judgments a priori can arise. Normally it is our sense meanings which are first definite, and our verbal formulations which are required to conform. In exceptional cases such as the abstract systems of modern mathematics, it may be the pattern of linguistic formulation which rules, and possible interpretation in terms of sense which is to be determined. But in any case where linguistic expression and sense meaning fail to go together and to be in accord, we must either roam the heaven of the supersensible, or take a meaning entertained to be inexpressible, or we must recognize an inconsistency or inadequacy and seek to correct the fault. However, it wants no extended examination of the complexities of logico-mathematical systems to reveal the egregious character of the supposition that whether a statement can be known true without empirical confirmation (as any analytic statement can) is relative to one's vocabulary. Even when we find it advantageous, from some point of view or for some purpose, to construe meanings in this exclusively linguistic fashion, by reference to definitions accepted and incorporated in a system, and to confine allowable certification of statements as analytic to derivation by accepted formal rules from such accepted definitions, it is still not allowable to forget that language would not be language if the terms which stand in such linguistic pattern did not also have fixed significations and criteria of their application. And whether two such meanings-in-application are or are not connected in a manner which is certifiable by analysis, and independently of empirical particulars, cannot possibly be relative to the vocabulary we command, however true it may be that our discovery of such connection can be facilitated or impeded by the presence or absence of mediating terminology, which would make deduction of it amenable to formal and accepted principles of linguistic derivation. Such a connection as that which holds between what we mean by 'square' and what we mean by 'rectangular', and the incompatibility of 'square' with 'round', need not wait upon any linguistic vehicle for their recognition. It would seem, rather, that the fact of such relationships is what rules our acceptable definitive statements and renders them significant of something more than verbiage. Such analytic connections may become amenable to formal derivations when the properties signified, or the things to which these properties are essential, are defined conformably to relationships which they actually have. Without such definitive statements, conformed to analytic relationships of signification, principles of logic would not generally be sufficient for the derivation of analytic truths. And as will be obvious, the range of such truths which can be assured from logic alone, without other premises, is strictly limited, and inadequate to the range of analytic facts in general. It has been pointed out that every analytic statement is deducible from any premise whatever; but deducibility, in the ordinary and most useful sense of that word, is a different matter from formal derivability according to some limited set of rules of linguistic derivation. The deduction of, for example, "All men are animals," from any premise one might choose, cannot be accomplished without recognizing, at some point and in some manner, the meaning of 'man' and the meaning of 'animal' and the relation of these two by virtue of which 'non-animal man' is a contradiction in terms. Thus if definitions, or relationships such as they may state, can be made use of in deduction only if they are previously accepted linguistic formulations, and if the only deductions allowed are those according to accepted formal rules of linguistic transformation and derivation, then the class of statements derivable from accepted definitions by accepted formal rules -- and perhaps called analytic -- will indeed be limited according to the vocabulary of defined terms, and according to what definitions of terms are accepted, as well as by reference to the particular rules of linguistic transformation and derivation which are accepted. And the distinction of statements labelled 'analytic' from others, could not be expected to coincide with the usual one, or the class of such statements with those which commonly would be so regarded, unless the devisers of this language system should have been most circumspect and ingenious in conforming their rules of derivation to acceptable logical principles, omitting none which ordinary deduction needs, and in making their vocabulary and their accepted definitions conform to the contents of an ideal dictionary. So far as an adequate logic goes, this conformability of what is accepted in devising a language system to what is acceptable by our ordinary logical sense, is a manageable ideal. But so far as vocabulary and definition go, it is obviously not attainable within practical limits. The point of importance here is that such devising of language systems must be aimed at some antecedently determined goal -- e.g., sufficiency for arithmetic, or for mathematics in general -- or else it is merely an idle game, played according to rules which are arbitrary, and with results having no serious significance. But the only kind of goal which makes this kind of game worth playing is one dictated by conformity of what is derivable from accepted definitions according to accepted rules with what are recognized as analytic truths, or some class of these. And the problem notably suggested by this reasonable intent of such procedure, is simply the question: Why are these results accepted as analytic truths, or some class of such? That is the problem having epistemological importance. The language system as thus skilfully devised is itself acceptable or not by reference to some antecedent criterion. If we had no other way of determining analytic truth, antecedent to such efforts, the efforts themselves would be pointless. And if we have such antecedent test of worth in a language system, the question of root importance, which has still to be answered, is what these criteria are and what is the source of such validity as they have. There is, then, no objection to recognition that when a language system is conformed to whatever would make it ideal, the distinction of analytic from synthetic will coincide with the distinction between statements derivable from accepted definitions, by accepted rules of formal transformation and derivation, and those not so derivable. We merely note, in passing, the practical impossibility of presenting in brief terms any language system adequate to recognizedly analytic truth in general, and the unimportance, from any point of view, of the non-coincidence of the class of such derivable sentences in a given language system with the class of statements acceptable as analytic, insofar as the language system falls short of the ideal. We should also recognize that when coincidence between the results of some rigorously devised system and some class of antecedently recognized analytic truths has been measurably approached, then the question whether the remaining differences represent defects of the system or, on the other hand, are indicative of previously unnoted defects of common conception, may well become a serious and important question. But the relativity of what is labelled 'analytic' merely by reference to accepted formulations of an arbitrarily devised language system, and without reference to conformity of that system to any antecedent norm, becomes a matter of no serious consequence whatever. Since language was not in fact brought down from heaven, but is a product of human devising, the important question relates to this norm or antecedent criteria controlling acceptability of statements put forward as definitive and the admissibility of rules put forward for guidance of deductive derivations. It is questions of that sort to which we have attempted to find the answer. Language is not language until itpossesses fixed meaning, determining what expressions signify and require as essential for their application. The criteria of such applications are sense meanings; test-routines and requisite apprehensible results of these. Such criteria are, and by their function must be, capable of envisagement in advance of particular applications. And the relations between sense meanings, ascertainable by comparison of them as such criteria, and independently of particular empirical occasions, is the source of our analytic knowledge. Such knowledge, like the meanings it concerns, is essentially independent of linguistic formulation, though the modes of linguistic expression are a frequent and more or less reliable clue to the relationships of meanings so expressed. Such test-schematisms of the applicability of expressions are, of course, of importance not only in connection with analytic truth but also, and perhaps more obviously, in connection with empirical knowledge, statement of which is synthetic. It is also true that the connection between concepts applicable to objects and the direct experience in which such objects are presented to us, is affected by certain complexities which have not so far been considered. And the notion of sense meaning, outlined above, will call for more lengthy examination when this complex nature of empirical knowledge is before us. We shall, thus, have occasion to revert to these topics in Book II. 1 Some would say 'syntactic' here instead of 'analytic'. But we are using 'syntax' and 'syntactic' in the narrower meaning previously indicated (footnote, p. 61) and nearer to the customary significations of these terms. A relationship of two expressions is analytic if the statement of it is an analytic statement. 2 It would improve the illustration if we should suppose that while all words defined, and all which define them, are in Arabic, the relations between these are expressed in English; that is, that the 'syntactic language' is one already understood. 3 As criterion in mind, sense meaning is intensional meaning rather than signification: it is that in mind which refers to signification. Signification comprises essential properties; and these properties have their being when and where they are instanced, regardless of the association ot them with any term or expression. Animality, for example, is a certain property objectively incorporated in animals, which would be just what it is regardless of any linguistic usage associating it with the symbol «animal». It was in order to dispel the subtle ambiguity of the traditional usage ot intension' -- ambiguity as between a meaning in mind and an objective character meant -- that it seemed necessary to add signification to the list ot fundamental modes of meaning. 4 The concept of a length of three meters is general, since many things may have this property. The concept of length is more general, and does not contain what is peculiar to any one length. Nevertheless it contains something more than the general rule for the routine of length-measurement -- we include with or in that rule a mode of determining what length the thing measured will be determined to have, or a mode of deciding for any given length, whether the thing measured has that length. 5 Such questions were discussed in Mind and the World-Order, Ch. IV and Appendix C.
6 Except 'from the practical point of view' -- a matter which we would best leave aside here. 7 It is extremely doubtful if any pattern of linguistic relation to other expressions can determine meaning uniquely. And expressions having more than one consistent interpretation, in a system having syntactic structure, are not constants but a kind of variables whose possible interpretations are values of them.